The mechanics of building a survey form are relatively straightforward. What is often more difficult is establishing the questions to be asked, the correct sequence of the questions, and the exact wording. Since you don't have to worry about the mechanics, you spend some time with your colleagues going over these other items. That's the point: create a draft of the form, use it, discuss it, and refine it until it's exactly what you want. In this exercise, you'll take on the role of a damage assessor after a natural disaster. Workers in the field will need a means to catalog and report where damage has occurred, to what infrastructure, and to what extent. They will also need ways to report the potential cost of damages, as well as what sort of support any buildings will urgently need until proper rescue and repair can begin. You'll create a survey to meet these needs, with certain questions only becoming visible when context requires it. Browse to survey123.arcgis.com, and sign in with your ArcGIS organizational account. Click Create New Survey and click From Survey123 Web. Create a form named Damage Assessment, enter tags (a minimum of one tag is required) and a description, and then click Create. The Survey123 website displays an empty survey, with list of available questions on the right. For the first question, you want to know the date of data collection. Click the Date button from the question list and drag it to the form. Click the newly placed question to open the Edit panel, where you can enter a suitable label for the collection date. The date question should default to today's date. To do this, go to the Default Value section of the Edit panel and click the Submitting date option. The survey automatically refreshes and the question defaults to today's date. Make your second question a Single Choice question. This will be a question about the severity level of the damages, so name the question Severity and in the Edit panel for this question, label the choices as Totally destroyed, Partially destroyed, and Minor damage. Make your third question another Single Choice question, this time for the type of construction. As you did in the previous question, provide choices for answers of road, bridge, railroad, and building. Click one of the add buttons (+) in the Edit panel to add the fourth choice. Alternatively, you can add to and edit these choices in plain text by clicking the Batch Edit option. The fourth question will be a Multiple Choice question for what types of assessment the site may need. While Multiple Choice allows the user to choose more than one option, it otherwise behaves the same as a Single Choice question. For this question, provide four choices: Water, Food, Shelter, and Medical. Make the fifth question a Number question for the estimated cost of damages. Label the question as Estimated cost (USD). The Number question will allow the user to enter only numbers and a single decimal point, making it ideal for working with currency. The sixth question will be an Image question. The user can either capture a new photo or browse and select a photo that is already on their device. Add a Multiline Text question for additional notes. While Singleline Text and Multiline Text questions both accept answers of any length, Multiline Text is more suited for extended answers such as these. You'll make the visibility of some of these questions conditional on whether the construction type is a building; other types of construction won't use these questions. To do this, click the Construction type question you set up earlier, and click the Set Rule icon that appears. This opens a new window that allows you to set visibility rules for other questions. Set the drop-down options to only show questions if the Building choice has been selected. Add a Geopoint for the final question. A Geopoint question will use the device's location by default. This value can then be modified manually by the user. Click Publish. A confirmation dialog box appears, confirming you want to publish the survey in its current state. Before you confirm, click Modify schema on the lower left of the dialog box to open a table that allows you to change the name and maximum length of the field. 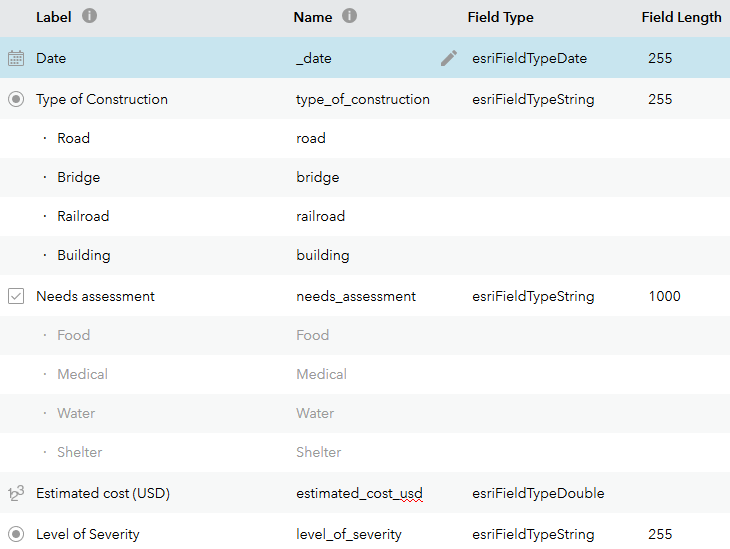 The name of the field is what the data is referred to as internally. After this, click Publish on the dialog box. Your survey can now be sent to others using the URL displayed through the Link button. You can now open your survey in any browser.